FUTUREWAVE is your partner on the path to transformation. We deliver on your challenges – meetings done differently, exploring innovative solutions, launching sustainable initiatives, inspiring employee engagement or building multi-sector partnerships – At FutureWave we Design, Facilitate, Capture and Catalyze Your Conversations that Matter. Contact us and lets start the conversation now. As the Women’s Leadership Council at United Way began thinking about a strategic planning retreat, we knew that we did not want to do the same old thing. If we were going to ask women to commit a half day, it needed to be inspiring, engaging, insightful, productive and fun. Well, what can I say – it was all that and more. By incorporating the “dare to dream” component into the retreat, we achieved a result far better than we anticipated. The WLC is now positioned on the cutting edge to accomplish some rather daring activities. Thank you Wendy for dreaming with us! Think about all the meetings you have attended where the top thought leaders in your field are assembled together in one room. Yet we miss the opportunity for real work, dialogue, interaction and innovation. Instead of bringing in a speaker for your upcoming Conference, Association Meeting or Community Engagement, consider opening or closing your meeting with a PossibilityNOW Event! A 3-8 hour PossibilityNOW Event will breathe new life into your Association Meetings, Conferences and Community Engagements. It will harness your group’s genius and curiosity about the “Next Wave” in your field. A room full of your colleagues who are knowledgeable and passionate about a particular subject, issue or profession. 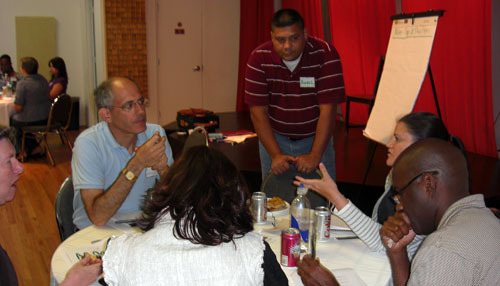 Provocative questions that engage participants in conversation and discovery around a given topic area. Everyone fully engaged. Ideas that flow from small group conversations out to the whole. Facilitators who skillfully lead the process and capture the themes, trends and emerging ideas as they happen! Ideas are your competitive advantage—don’t let them disappear! Imagine the power of ideas and insights generated by these discussions. And all of it captured by the FutureWave “IDEA” Workers who support your meeting through strategic illustration, storytelling, and video/digital filmmaking. Knowledge that can help you make informed decisions on where to put innovation dollars, how to develop people, realize untapped opportunities and even identify the theme for your next conference event! Building Multi-Sector Collaborations to support sustainable business in North Carolina. New Economy Think Tank – How do we build multi-sector collaborations to develop a common vision and strategy for launching a social movement for a new economy agenda. Colorado Department of Education Literacy Initiative – Creating common literacy language and meaning to build statewide collaboration and grant opportunities. Experiential Training and Development Alliance – Capturing the Genius in the Room to identify current and future trends in the field of experiential learning. State Youth Council PossibilityYOU, igniting youth conversations to identify key teen needs and potential statewide projects to serve North Carolina youth. 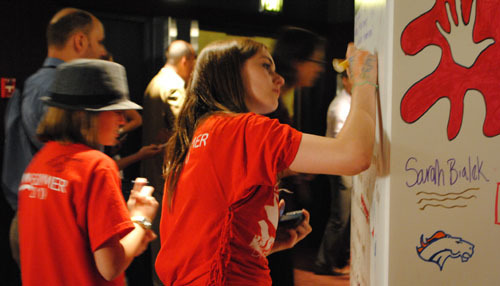 Ideation Conference – Capturing the best practices of people doing good in the world so they can do it even better. FutureWave Summits were designed to help meet the needs of organizational mavericks who want strategic planning and meetings done differently; big ideas from a diverse mix of people; and guaranteed group engagement, expanded thinking and drive to outcomes. In the past, when things were simpler, it was possible to put a few key leaders in a room and create all the solutions and action plans for an organization. That was then … this is now. In today’s world, it is more important than ever to bring all voices together when entering into strategic planning and innovation processes. Companies can leverage the diversity of perspectives and tap into the collective genius, to generate visions for the future that meet the needs of both today and tomorrow. 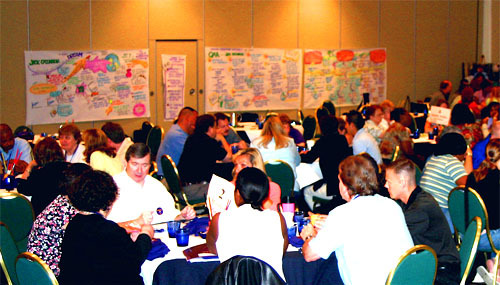 We offer a multi-day, large-scale (10 – 1000 participants) ideation and planning process where people work together to envision and design the future of the organization. Our fun, interactive and engaging Summits guide you toward clear, pre-established strategic outcomes. Keep the conversation going long after the event! Too often these great meetings end as the people walk out the door. Gone are all the innovative ideas and intended action plans. Today, your ability to engage people in conversation, build collaborations and capture ideas is essential to the success of any endeavor. 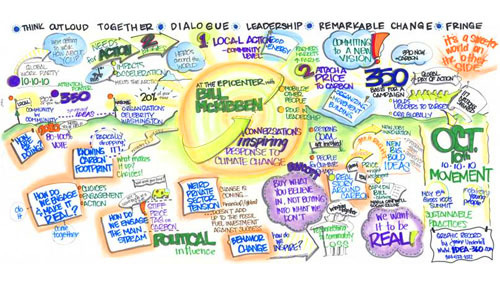 To help you capture and keep the conversation and action plans alive, we leverage the amazing advances in collaborative communication platforms, social media, corporate storytelling, graphic facilitation and film. We can inform or build your social media platform real-time, in the room. Our storytellers provide content for blogs and marketing communications, photos, film clips and graphic facilitation maps help capture and share the story. Action plans and ideas are logged onto the site for continued conversation. We say that Youth are our greatest resource; yet when was the last time you sat down and really talked with someone of the younger generation? As we continued to lead multi-sector group engagements, we noticed one voice consistently missing from the conversation … the YOUTH voice. We set out to offer a solution on how to truly engage young people into the conversations that matter today. We combine leadership training, large group engagement, high energy team building activities, video and film, questions that inspire and ignite imagination, facilitators who care deeply, and know-how to connect with teens. Put it all together, shake it up—and you get a FutureWave YouthNOW event! Call us to book a YouthNOW event.